The staff at Anderson Cleaners is noted for its expertise in two main areas: difficult stain removal and wedding gown service. No matter what the stain, we have a solution. If you have a stain that others have failed to remove, send it to us. Hidden stains, like perspiration, champagne, or sugar-based, will yellow with age if not properly removed. Successful stain removal depends on fabric, type of stain and the age of the stain. Our expert training, along with special chemicals and equipment, insures the safest methods for proper stain removal. Anderson Cleaners accepts world-wide mail orders for your problem garment. Never put a garment away with stains; bring it to the cleaner immediately! Blot a stain. Do not rub it, for this removes some of the color and deepens the stain. A clear sugar stain will turn yellow with age, similar to an apple that turns brown when left on the counter, cut in half, from oxidation. Perspiration should be pointed out to the dry cleaner. Do not attempt home spot removal on dry cleanable garments. 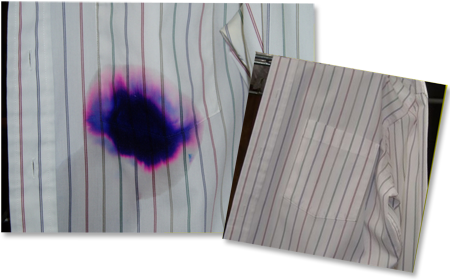 Oxidation is the result of an oil stain left in the garment for an extended period and is the most difficult stain to remove. White fabrics may contain fluorescent brighteners which cause permanent yellowing if put in the sun to dry. The staff at Anderson Cleaners has great success with garments that were washed at home and still have stains.